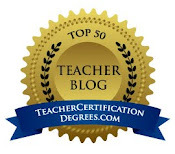 I am cross posting this post with Ruth Ayres Celebrate posts and CyberPD hosted by Cathy Mere, Laura Komos and Michelle Nero. I celebrate all the different learning communities I am in, both virtual and face to face. This summer has been filled with different ways to learn and people to learn with. I appreciate all of the opportunities I'm being given. My thinking is always stretched when I can learn with and from others, giving me new insights to ponder. As I read the first two chapters (and the bonus), I began to wonder what this might look like with adult learners. My days include two related jobs: I work with small reading intervention groups for part of the day and coach teachers the other half. Some of my coaching work will be done with vertical teams of grades 2 - 5 and K - 1. In the past, our monthly data team meetings have been done in grade level groups, so working with vertical teams will be different for me. My principal has suggested we look at the literacy framework more closely and hone in on planning instruction and using formative assessment to gauge how our students are doing. We are going to plan lessons together on our teams, go in and watch each other teach, and give each other feedback. Our district focus is on assessment this year and how those assessments can inform our instruction. Just as it is in my classroom with students, it's important that I build knowledge together with adult learners too. I've taken suggestions from Kate and Maggie and adapted it for my coaching. I'd love feedback from others on what you think works and what needs tweaked. I've tried to keep in mind the three qualities that make learning "stick." They make the abstract concrete (love the word salad). I used Clare and Tammy's Assessment in Perspective (if you haven't read this book, you must) and Fountas and Pinnell's The Continuum of Literacy Learning (provided to all K - 5 teachers in our district) to help me articulate my thinking. My Topic: How do we use our assessments to plan for meaningful instruction within the reading workshop? I used Piktochart to create this very simple infographic to help guide teachers' thinking. I'd like to be able to create a chart with them after going through the process together. I'm thinking I would supply teachers with demonstration notebooks (or have them bring something they'd like to use) and we would build these together. I envision using these to support teachers in collecting ideas for teaching different strategies, so they are a little different from those described in the book. I imagine a section for each of the three ways of thinking about text: Within the Text, Beyond the Text and About the Text, which would then be divided into strategies that fall under each category. I also see a section about different instructional decisions teachers need to make when looking at their assessments. I can see these notebooks being very individual to meet teachers' needs, and I also know it is important for me to begin to build my own demonstration notebook before school begins. 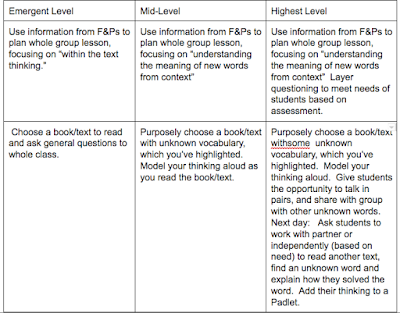 I would build this chart with teachers as we talked about different levels of using assessment to inform instruction. I would give teachers a blank table and ask them to complete it together and we would share with the whole group. I can see building bookmarks with teachers around different skills and strategies. Giving them (and me) the practice of deconstructing the strategy and then creating bookmarks, will enable all of us to create the necessary bookmarks with our students. I realize as I write this that I flip flop between making instructional decisions based on assessments and supporting teachers as they work to support their students. Maybe it's too messy. Once again, this is one of those things that I will need to figure out as I go. Wow Julie! I like your thinking here. Part of what you're describing sounds like our 5 step process PLC minutes...the other part sounds like the tools we use within the process. Thanks for bringing this idea into my realm of thinking. It helped me make some new connections to our reading of diyliteracy. Now I'm thinking about how to connect the demo notebook with coaching and the coaching cycle...hmmm. I'm with you in celebrating learning with others. It's been powerful for sure. 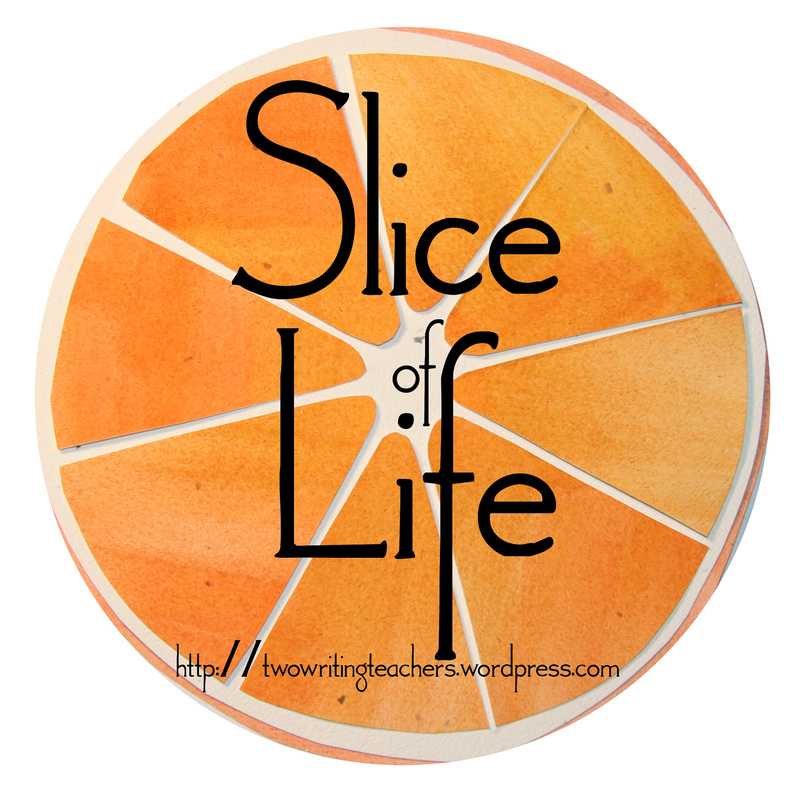 Awesome post about Celebrating New Learning Communities and DIY Literacy. Success would be achieved in different ways, yet perfectly it’s necessary to learn more about the things that can useful for you to maintain a balance in all the situation happen in your life. Thanks for sharing here your experience about funny thing has happened when your role has changed as a reading support teacher which would like to share with my students who are looking for psychology assignment help online from me at Assignment Help Folks where I am providing assignment writing services. I would also recommended your blog to many people. Thanks. This is really nice, Julie. It is so detailed and helpful. I love the goals that you have set for yourself and your teachers. I also believe that it is really important to build our own demonstration notebooks. Thank you for sharing. Such thoughtful ideas, Julie - I especially love the way you are envisioning how this work would be done in collaboration...that's the key, isn't it? We need to think of building and creating these tools with our students! I loved reading your thinking here Julie. I have been reading the conversations about DIY and they have been awesome. Your goals are so thoughtful and you have me wanting to make a Piktochart! I like the idea of centering around within the text,beyond the text and about the text. 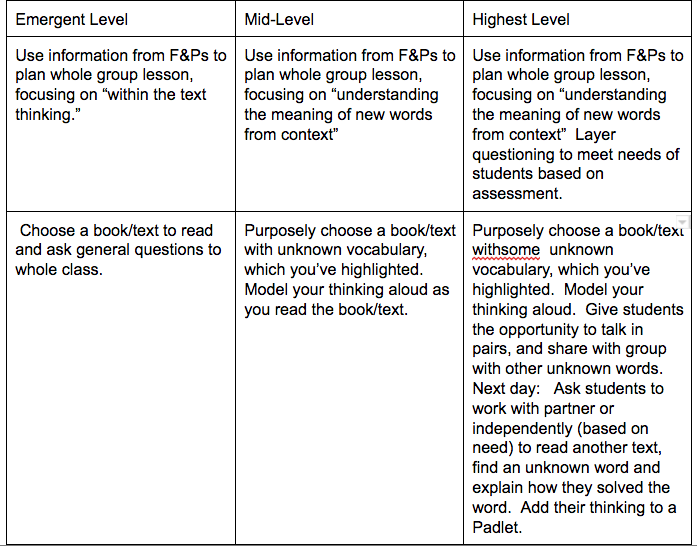 I also like how you will work with teachers to plan instruction.The micro-progression for shared reading lesson will help raise the level of instruction. Thanks for sharing. I enjoyed reading all your ideas, Julie. Because I'm no longer teaching, I'm not participating this year, but I especially love the idea of the demonstration notebook. Because most of my work was with individual students, it would have been a marvelous & helpful tool. I mostly used folders of different kinds of crafts. Thanks & best wishes in all this learning. I would love to see images of how some of these demonstration notebooks evolve. I hope you will share! I love our varied learning communities too. Isn't it great when our participation pushes our thinking? I love that you are using assessment as the "driving force" here! And I love that you have a plan to adapt demonstration notebooks to meet your needs of supporting teachers... you have some great lessons planned. You make a great point about getting practice yourself deconstructing strategies! I love how you morphed this for adult learners. I anything else the results of doing the work will help teachers see how it feels to use the different tools. As for me - educate someone is the hardest work in a world. So I really want to admire the high quality of your work. You are a really good teacher. I see your inspiration and enthusiasm in your work. I get to see more cool ideas from you in future. Professionals at custom-paper-writing.org may decide all your paper troubles as soon as you need. Try out reading this article next time, i think it may be helpful. Rapid advancements in technology, declining internet costs, rising internet bandwidth speed and high standard of living have boosted e-learning. You like write the full detail regarding celebrating learning communities and DIY literacy. We should expected desire piece of information for the whole communities who have desire to peace, happiness in whole society. However, I try to get essaymama.com reliable for the students and people who interested in research related task.